For Christmas, I got this book entitled The Naturalist’s Notebook. It encourages us all to be backyard naturalists, taking note of what is happening in our own small worlds. Learn the names and taxonomy of plants and animals around you. Become familiar with their basic ecology. Go on walks with knowledgeable naturalists and take notes. Ask how and why questions. Scrutinize, touch, smell, listen and measure. I am just beginning my journey as a naturalist. I think I have the curiosity thing down. I go outside and I’m intrigued by so many things that I see. I like collecting specimens and bringing them home as little treasures. Sometimes I like to draw the things I find or look them up if I don’t know what they are. 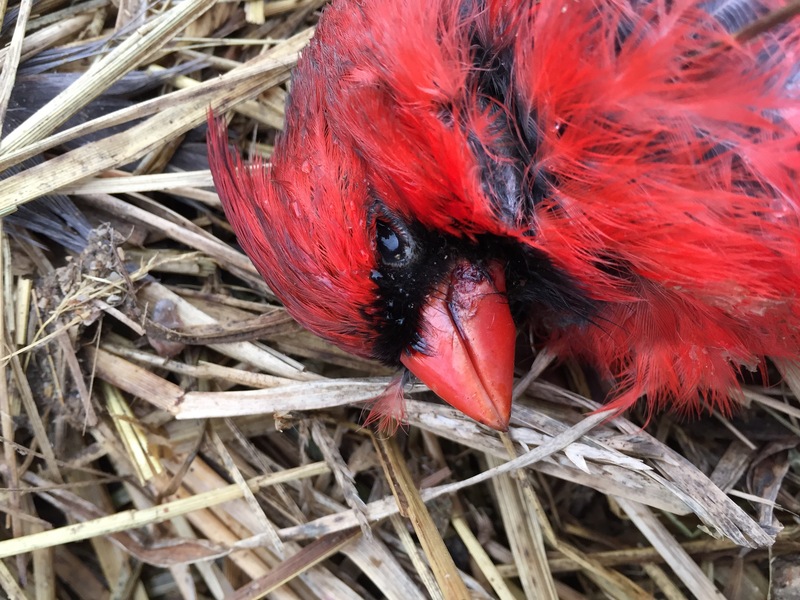 I had an opportunity for some close scrutiny when I found this dead cardinal in my garden a few weeks ago. We have loads of cardinals here at the farm. They don’t seem to migrate as they’re here throughout the winter. They LOVE the black sunflower seed I fill the bird feeders with. Sometimes you’ll see 15-20 of them at a time, lined up on the fence and scattered in the yard. The males are bright red and the females are usually brown. That’s about all I know about them so I looked them up on the Cornell Lab of Ornithology to learn more. First of all, this bird’s official name is the Northern Cardinal (Cardinalis cardinalis). It belongs to the Order Passeriformes and the Family Cardinalidae. Some other birds who fall into this same order and family are Buntings, Tanagers, and Grosbeaks. They are considered large songbirds, with a long tail, prominent crest and short thick beak. A raised and pointed crest usually means are cardinal is agitated, while a lowered and barely visible one is often seen when resting. Cardinals are fiercely protective of their territory, often leading them to peck at their own reflections in windows for hours. I wonder if this guy got into some kind of territory dispute or if he simply died of natural causes. There’s weren’t any windows near him though he may have fought with another cardinal as there are so many around. They eat mainly seeds and fruit, with some insects (like beetles, crickets, katydids, leafhoppers, cicadas, flies, centipedes, spiders, butterflies, and moths) for snacks. Common fruits and seeds they like are dogwood, wild grape, buckwheat, grasses, sedges, mulberry, hackberry, blackberry, sumac, tulip-tree and corn. Around here they would have a lot of wild grapes, grasses, mulberries and corn. Though cardinals typically move around in pairs during breeding season, in fall and winter they form large flocks of 12-24 birds, as we are seeing around the bird feeders here lately. Mating pairs may stay together through winter, but many split up by the next spring. The finished nest is usually about 2-3″ tall and 4″ across. Cardinals usually build new nests each spring, wedged into a fork of small branches hidden in dense foliage. Females lay 2-5 grayish-white or greenish-white speckled eggs, each about an inch long and 3/4″ wide. The eggs have to incubate 11-13 days before hatching and the new babies stay in the nest for 7-13 days after birth. A mating pair will have 1-2 broods of babies each spring. Now I want to go looking for nests. I wonder which trees and shrubs they will prefer around our yard. I can’t wait to watch for babies come spring! Cardinals like to sit low in trees or shrubs or to hop around on the ground. They don’t tend to be strong fliers due to their short, round wings. You usually see them taking short trips instead of long soaring flight. Can you see how their feathers keep them dry. The morning dew just pooled up on this bird’s wing. I thought that was so neat! I wonder how they do this. Maybe they are oiled like our ducks’ feathers? Check out his feet! You can see how he sits on branches with ease with those long claws to help him grip into whatever he lands on. 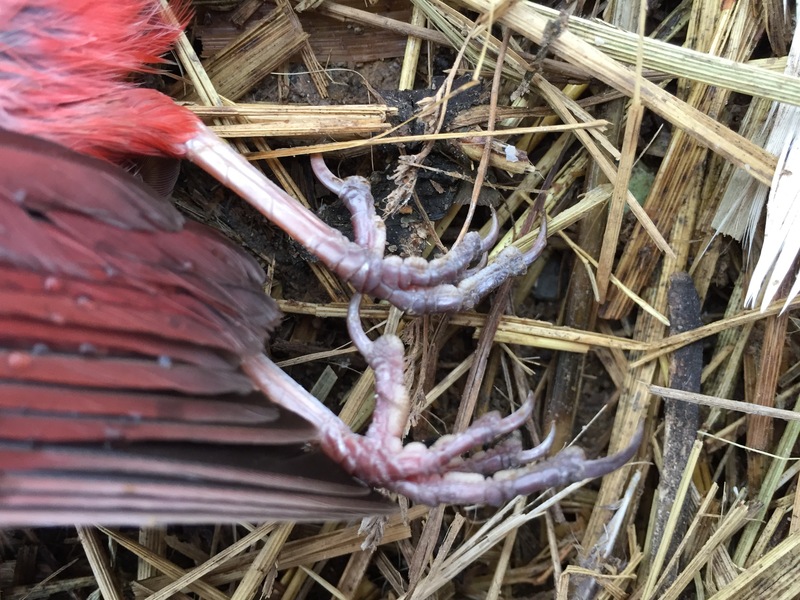 Cardinals can live 15+ years! There’s an estimated 120 million of them in America and Mexico. Finally, their calls. I always thought cardinals sounded like they were saying: birdie, birdie, birdie, birdie. Apparently they have loads of different songs and calls. You can listen to some of them on the Cornell site. I think these guidelines will help enrich my knowledge of my place and add some interest to my walks. What did you notice in your piece of the world today? How are you guys getting along? Do you need help with anything? We live in New Richmond so not too far away. To answer your question, “What did you notice in your piece of the world today?” I have a pair of roosters that I incubated and hatched we call them Runt and Big Gray. We keep them in a large fenced area together and we have our hens and another rooster in a chicken tractor. Runt is absolutely in love with me. When he sees me walking to the pen he gets all excited cackling and crowing. When I enter the pen, he does a flamenco dance around me as if I were a hen. He keeps between me and his com padre who acts like a normal rooster and wants to tear into me. With Runt around I never get attacked by Big Gray. It is the oddest and coolest thing. I got wooed again this morning and thought I would share. Tom, your rooster story made me smile. They have so much personality, don’t they? We are doing okay so far. I’m tired but holding it all together. I may reach out for some help with fencing when ground thaws if Josh is still unable to help. I’ll keep you posted. Thanks for the offer. How’s life in New Richmond? Did you ever set up your aquaponics system? No. We haven’t set up the Aquaponics system. I still have to work a day job for insurance and that would be a full time commitment. We’ll just keep doing a little bit at a time with the time available. New Richmond is nice. I hope to be helping out at Spencer Park Aviary this year with some shrubs that I am growing. Maybe we can get some landscaping started down there and we can get more people to visit New Richmond. Hi!! I like your posts very much and I like your eggs even more !! Wow are they great. Can you give me a clue as to when I can pick them up at Jungle Jim’s?? We usually deliver to Eastgate on Wednesday or Thursday morning and they do inter store transfer after that to Fairfield. Which location do you shop at? If you’re close to Batavia you can also come right to us!